This past summer my family and I stopped for a cold treat at our local ice-cream stand. We talked about my upcoming Senior year until a small car caught my eye. 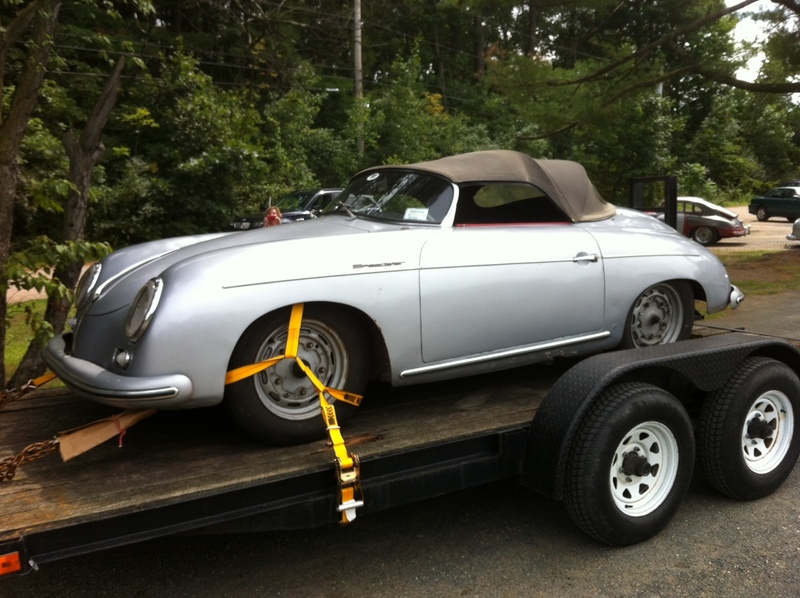 Here, just feet away, lay a silver Porsche Super Speedster strapped to the back of a flat bed. To most, this would seem like a broken down car on the way to the shop- but to me, I saw a story. Porsche started producing its first cars in the 1950s with the 356 and eventually the Super Speedster. This was the top of the line sports car in Europe, and only a handful remain in the States. I ran over to the car and admired its smooth lines and beautiful craftsmanship. After talking with the owner, I learned it had just come from a full outer body restoration and was on its way to New York for an interior restoration. I was instantly intrigued with the idea of restoring a piece of automotive history and as the school year came around; I looked into how I could make my own piece of Porsche history. In today’s market, professional restorations have begun to incorporate many handmade parts to replace the worn and time rotted pieces for a factory fresh interior. 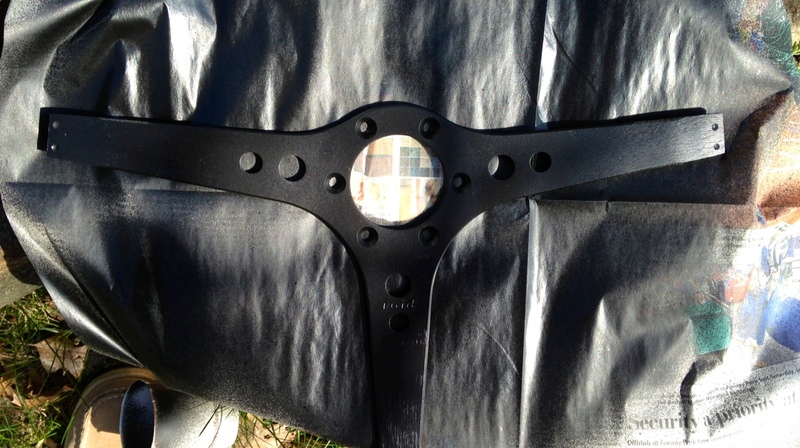 Specialists can remake and rebuild everything from the gas gauge to the ceiling lining in nearly exact or even better condition than they were fifty years ago. This made me think how hard would it be to make my own steering wheel? Not just a shell or showpiece like anyone can buy, but one that I made with my own hands like they used to be made. After I had my mind set on the steering wheel, I began to look into the multiple types and differences that lay behind each wheel. 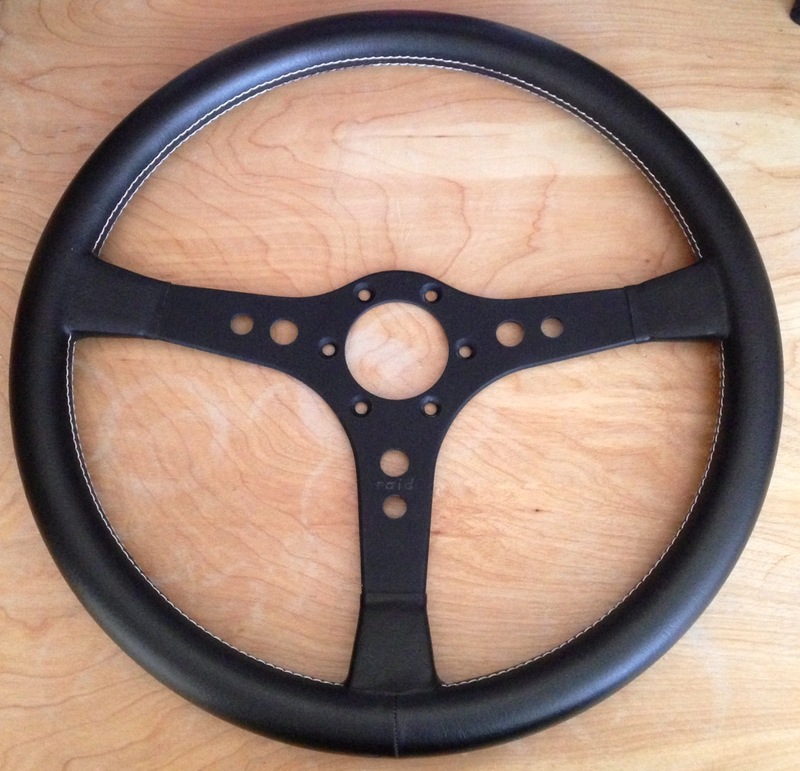 My first challenge was finding a suitable donor wheel for my project. I searched the web with only pricey results and soon headed to the local newspaper. To my surprise I noticed a local swap meet the next weekend at the Big E and marked my calendar. I headed to a local car parts swap meet to find a donor rim, after a little bartering, and a good eye, I found a new wheel with some cosmetic imperfections, perfect for part of my restoration! After I got the donor wheel, I set to work of tearing it down for sizing. 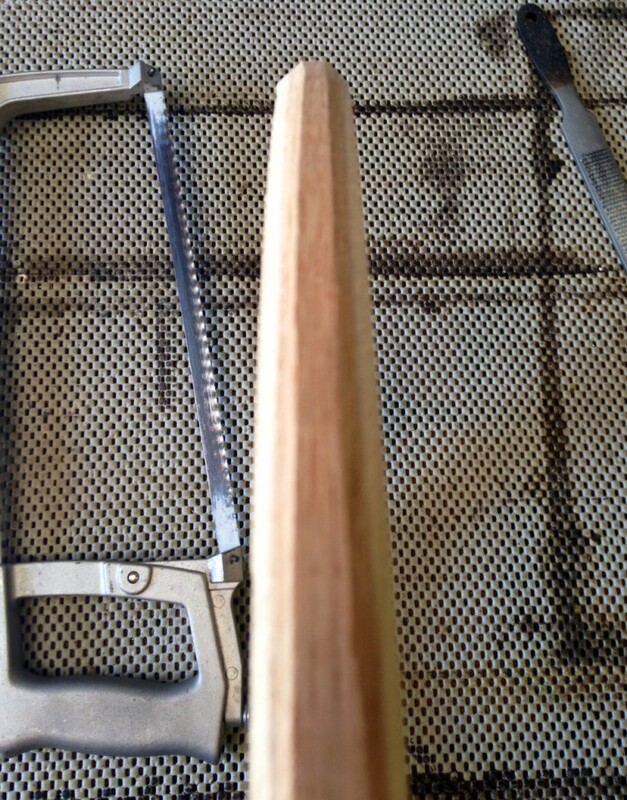 I started experimenting with three different ways to make the wood core, and settled on a “hybrid” method of my own. 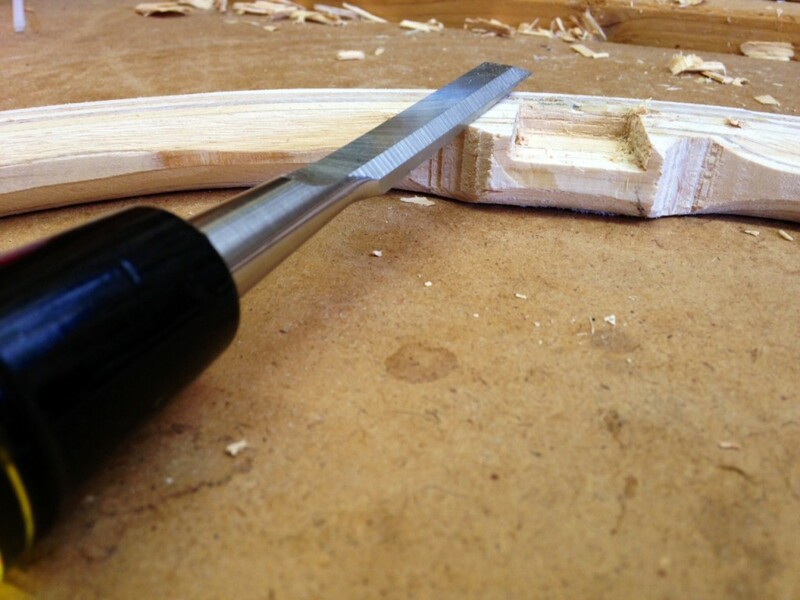 I started by making a jig for the base wood rim (circle) and would gradually build the thickness by layering over multiple bends, shaving, sanding and gluing. I continued this slow and tedious process, layer and waiting, using clamps to keep the wood firmly where I wanted pressure and keeping my desired wheel shape and size in mind. 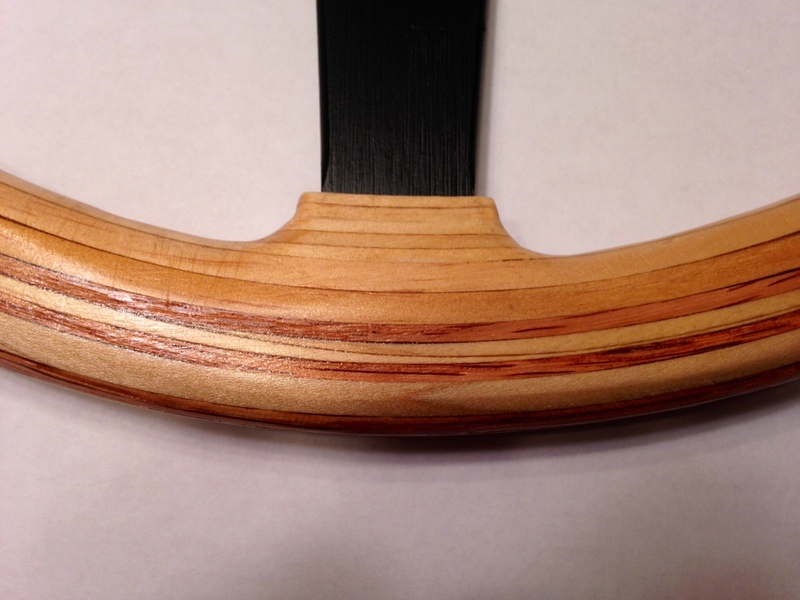 I wanted to incorporate a “piping effect” using the woods natural grain. I did this by alternating both spruce and maple to create the desired contrasts. 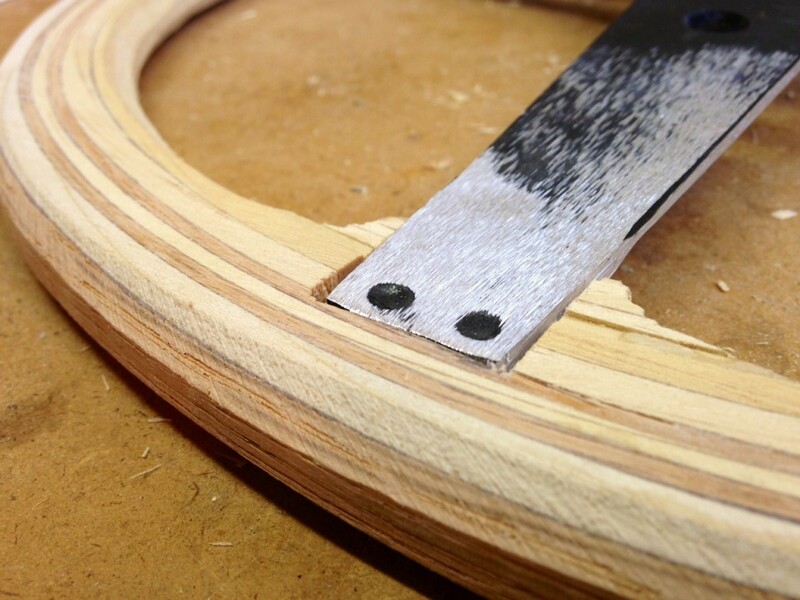 After I had the basic outline, I used my donor hub as a template to mark where I want the spokes to lye on the rim, with a few scratches of the pencil, I began to cut out the unnecessary layers of wood. With a scrape, light sand, and final layer of wood, I began to use a belt sander to create the basic circle shape and contour of a steering wheel. 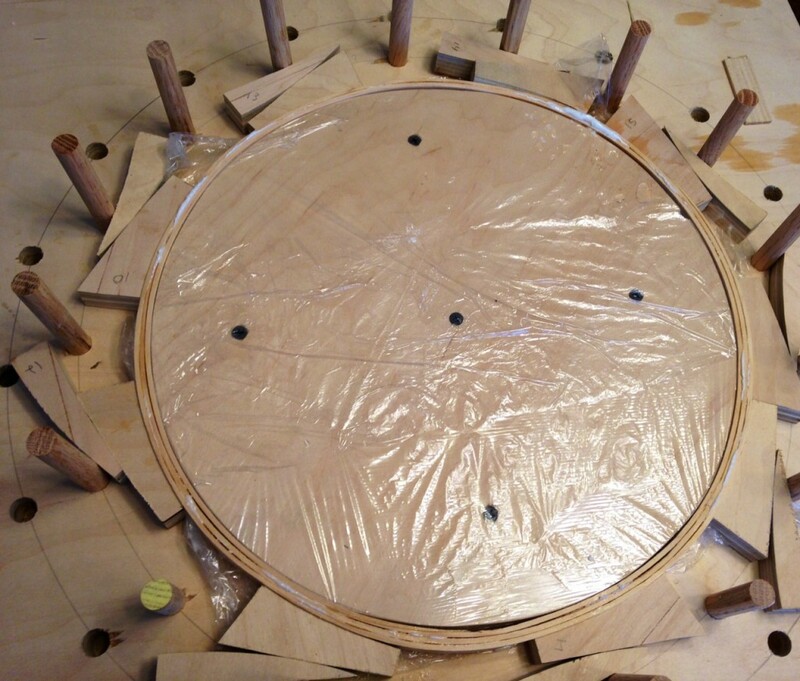 Now with the basic shape of the wheel, the sanding began by hand. Slowly but surely, the rough surface began to take shape and transform into a beautiful curve. It was great to finally see my hard work start to pay off and the layered wood created the perfect contrast. When I had the three spokes finished, out came the chisel! I scraped the spoke shape into each of the three contact points of the wood rim, careful not to take away too much or damage the fragile edges. After multiple test fittings, I had the metal spoke flush with the wood rim in all three spots. When the fit was right, I prepped the metal spoke for painting. I would use a semi-flat matte finish on the center. 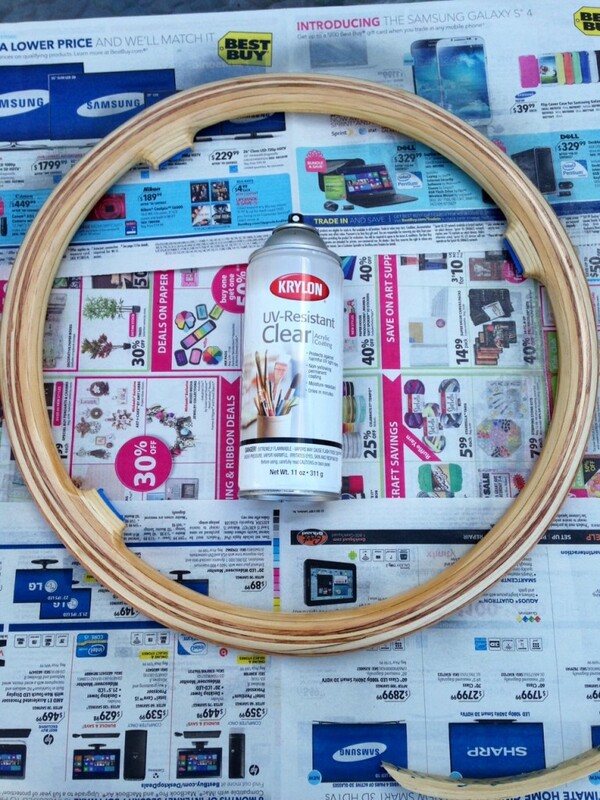 At this point I was debating whether to stain the rim, or keeping the natural finish. With a few practice stains and comparisons to a clear coated natural finish, I knew the natural finish would show the wood grain the best. I started with a heavy layer of clear coat, sanded it down for a smooth surface, and then slowly alternated spraying each side with thin layers. With the sealant on and a freshly painted hub, I mixed up and epoxy compound that I had used for setting the wood originally to mate the semi-flat matte spoke to the natural stained rim. 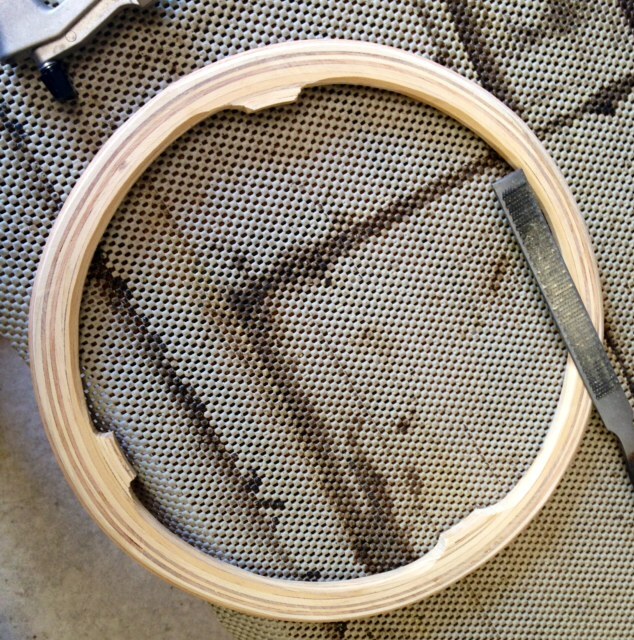 I set the spoke within the rim, fingers crossed, and waited for the Epoxy glue to set. I came back half an hour later and breathed a sigh of relief. I had finally finished what I had set out to do over a trimester ago! 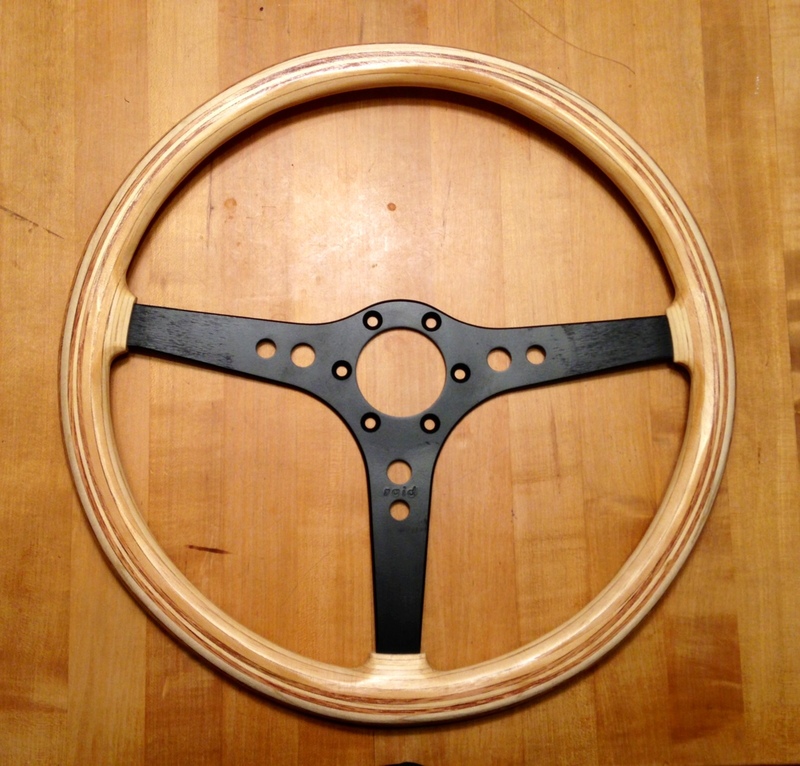 Not only had I created a wood rim steering wheel like the one I had seen this past summer, but I had done it by hand and it turned out great! This whole project has been an incredible experience for me, I had the chance to work with my Dad, used all sorts of wood working equipment with my newly learned skills, as well a few import lessons; never give up and always plan ahead. Though this might have seemed like a straightforward project, I spent just as much time planning as I did working, and I am very glad I did. I took hundreds of photos to document my process, sketched and laid out each segment, and with the support of my parents, Susana White, and my neighbor, Ken Barrett, for letting me use all of his knowledge and wood working area, I created a true piece of automotive history and memories I will have forever. I will never look at a wooden racing wheel the same way again, there is so much more beyond the grain. Terrific story, Alec. I often think that as we teach different aspects of the fine arts, we underplay the importance of craftsmanship for its own sake. You’ve made this discovery on your own and reported on it with eloquence. Congratulations on an awesome project! This kind of work really does take patience, care, and passion. Nice work Alec – now what kind of car are you gonna put it in? I am impressed with your dedication to this goal, and with the patience, planning, and talent you displayed in completing this project. I am glad to see the pictures and to read this article that effectively documents the process. The wheel is beautifully crafted, now you need to start on the rest of the Porsche. Nice job! 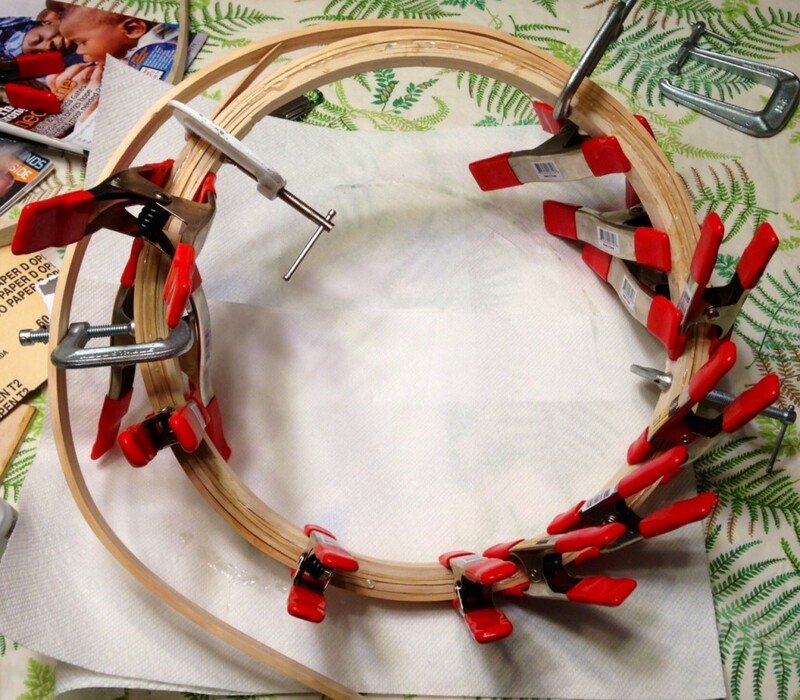 I want to make just a hoop like you did in the photo with the red clips… how did you bent the wood? And what kind of glue and wood did you use in this project? Thanks in advance.